Big, beautiful home in Crosby Landing Beach neighborhood. In 8-10 minutes' walk, your're on superb Crosby Landing Beach. Back at the house, fire up the gas grill & relax on the deck. 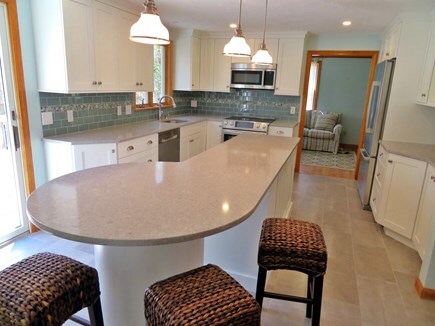 Bright and cheery with loads of counter space. The family/TV room is also on the main level with a sleep sofa. Master bedroom with a queen size bed. Second queen BR. All BRs are on the the second level. Twin bedroom #2 also includes a crib. This home has 2.5 baths. Half bath in on the main level. Roomy lower level rec room is an ideal kids' headquarters. RATES SHOWN REFLECT A REDUCTION UP TO $600/WEEK FOR PEAK SUMMER WEEKS! Totally New Kitchen in 2017! 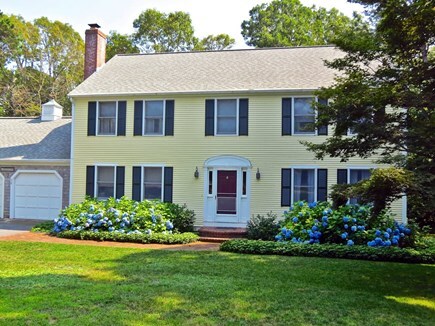 An 8-10 minute walk from this big and neat-as-a-pin two-story home brings you to sweeping Crosby Landing Beach, considered Brewster's best by many. It's a beautiful sandy, bay beach with gentle waves for younger children. At low tide, the water recedes a mile or more, leaving the Brewster Flats exposed -- a fun place to walk and explore nature. There just aren't many homes you can rent that are much closer to this popular Bayside beach. 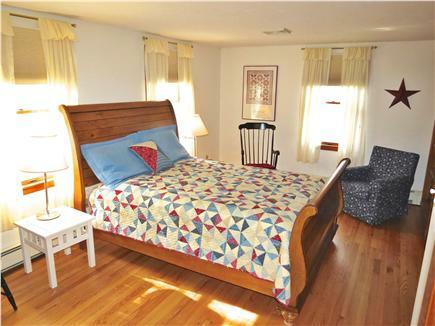 The house is kept in excellent shape by its owners and is part of a quiet, upscale, East Brewster neighborhood. 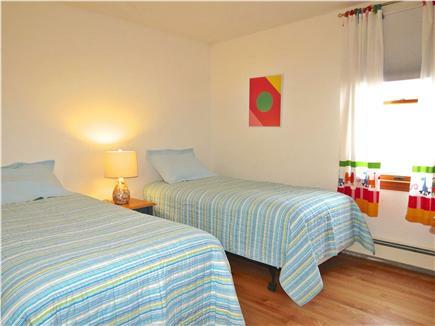 It is the ideal summer vacation situation for a large single family, a multi-generational family or two young families. The house is located on a side street with no outlet to a main road. No one other than residents enters the neighborhood, so traffic is kept to a minimum. A short bike ride down Crosby Lane brings you to Nickerson State Park where you can fish and kayak in the ponds. 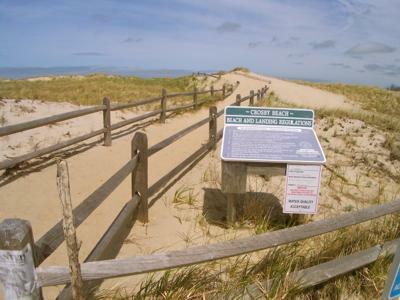 You can also hook up with the Cape Cod Rail Trail and ride for miles in either direction. You can use the Rail Trail for short adventures, like going for a Smoothie at the Chocolate Sparrow in Orleans, or day-long outings, such as riding to the National Seashore in Eastham with its stunning broad beaches right on the Atlantic. You can enjoy all of these activities without getting in your car or worrying about where to park! Back at the house, you'll love operating in the brand new kitchen, totally renovated for 2017. 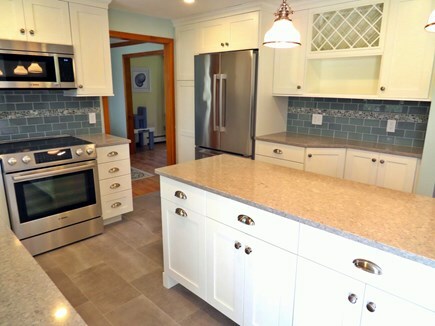 It has all new appliances, new cabinets, new quartz countertops and a new tile floor. 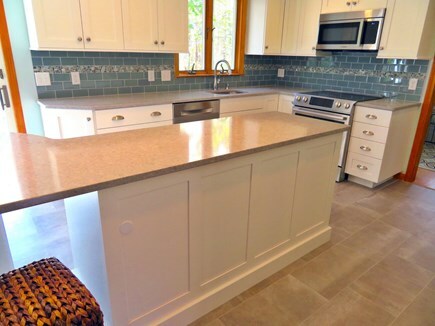 Guests have complimented this property for its kitchen equipment, including all the pots, pans and tools you will need. There's plenty of space to spread out and comfortable furnishings where everyone in your group can relax. The home has central air conditioning for the second level plus two window units to cool the main level. There is cable TV and wi-fi. 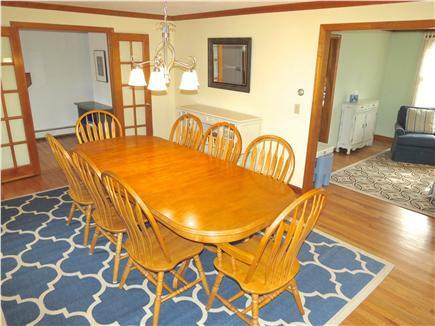 Your whole group will be a comfortable fit around the large dining table -- when you're not dining outside on the roomy, private deck just off the kitchen. Guests have complimented this property for its well-equipped kitchen, including all the pots, pans and tools you will need. The main level family/TV room has a sleep sofa, which converts to a queen size bed and serves as a fifth sleeping accommodation in addition to the four bedrooms on the upper level. There are two bedrooms with queens, two with twins. 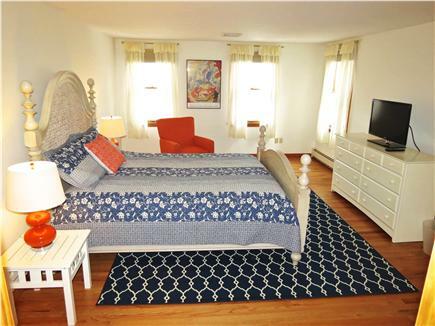 The master queen bedroom has a full bath en suite. The other three bedrooms share another full bath. 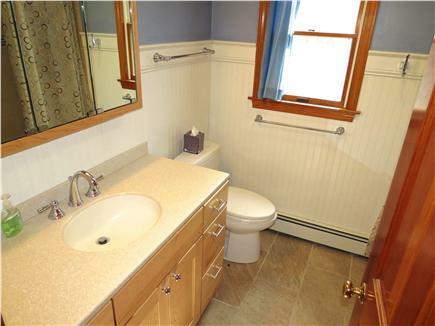 There is also a half bath on the main level. 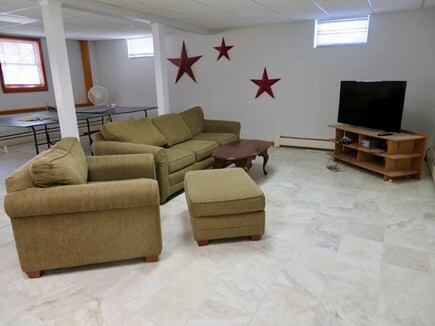 The roomy basement has a ping-pong table, some toddler toys, and an old-school Game Cube with video games the whole family can play. This is a great place to hang out on a rainy day or after returning from a busy day at the beach. It also makes an ideal separate play space for kids. Outside there is an enclosed shower. 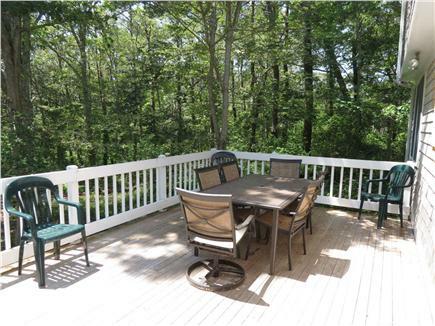 The deck has with comfortable seating and a locking gate so toddlers can be safe. Just off the deck you'll find the enclosed outdoor shower, renovated for summer 2015. 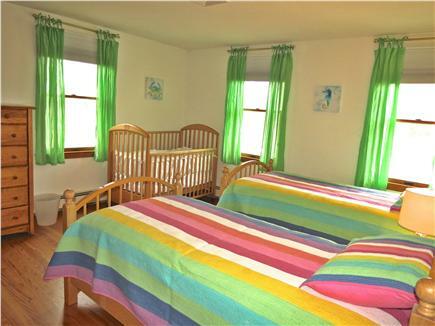 There are several furnishings that will make your trip with children easier including a crib, a pack-n-play, a Little Tikes table with two chairs, and sand toys and chairs for use on the beach. Please click on the Rates tab for detailed information about weekly rates. 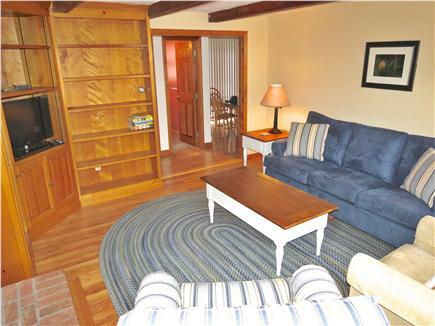 This property has a 7-night minimum during the peak season. As is customary in vacation rentals there are additional fees to the rates listed. Those fees include: $115 reservation fee, $50 Accidental Damage Protection fee (ADP) and a refundable security deposit of $250. Also please note that this property does not included linens, we offer a service if you would prefer not to bring your own. Additional pricing info: $100 reservation fee, $50 Damage Protection fee, $250 refundable security deposit, State and local taxes of 14.45% will apply.